I could have waited another couple of weeks until the book was more available to make an announcement. For me this has been an off and on process over the past 11 years. I would start writing, work on a chapter or two, then walk away for months at a time. Each time I came back to it, I would toss everything and start from scratch. This project should have been complete a long time ago. Only by the grace of God has this come to pass at all. If you’ve been reading this blog I hope by now you’re aware of a couple of things. I believe everything we do should be God honoring and Christ centered; Any sermon I preach will always come back to the Gospel; Sola Scriptura was the motto of the Protestant Reformation and the scriptures remain our highest source of authority. As a result, you should expect certain things of this or any other book I write. There will be several direct quotations from scripture and even more references. Even though the book is written to further the understanding of believers it doesn’t end without sharing the Gospel. Clicking the thumbnail at left will open a full size image of the back cover. Below is the full text of the Wholesaler’s Summary which Amazon nearly printed in it’s entirely. The 500 words below offers more detail than the back cover but is only a glimpse of what you can expect to find inside. The Bible tells one story. It’s about how a Holy God deals with a sinful, fallen and broken people. At the center of that story is Jesus. Fellowship was broken in the Garden of Eden but God didn’t really go anywhere. The story of “God with us” doesn’t begin and end in the Gospels. GOD IS NEAR is his promise to his people, and it’s found in every book of the Bible. 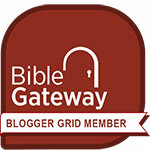 There should not be a disconnect between the Old Testament and the New. The Father, Son and Holy Spirit are actually at work throughout. Much of what God did in bringing Israel out of Egypt and establishing a kingdom is symbolic of the Christian church. Moses is a type of Christ in many different ways. The tabernacle, veil of separation, lamb of sacrifice and office of the High Priest are all meant to help New Testament believers understand who Christ is and what he does. 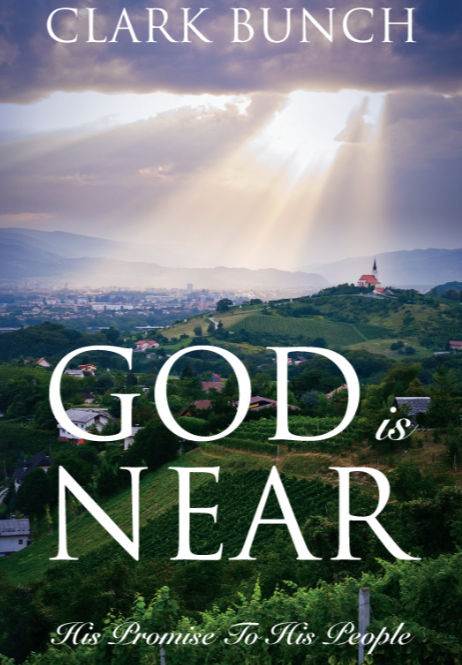 God is Near: His Promise to His People does more than analyze the relationship of the books of the Bible. Beginning in the Garden of Eden we embark on a journey through God’s Word, exploring the relationship between God and his chosen people. God is holy and only what is holy can come into his presence. But he has always been close! God spoke to Moses from the burning bush, appeared to the Hebrews in pillars of fire and cloud, and radiated his visible presence above the tabernacle. At Sinai his people saw him descend on the mountain and heard his voice, and at Jericho they obediently watched as he won their battles for them. God was in the manger at Bethlehem and on the cross at Calvary. He filled the upper room in Acts 2 and the hearts of 3,000 believers who repented and were baptized that same day. Christianity is not a religion of rituals and rule following. The Heavenly Father seeks a relationship with each of his children, and has gone to great lengths across the ages to make that possible. God is real. God is love. God is near. Seek him while he may be found. 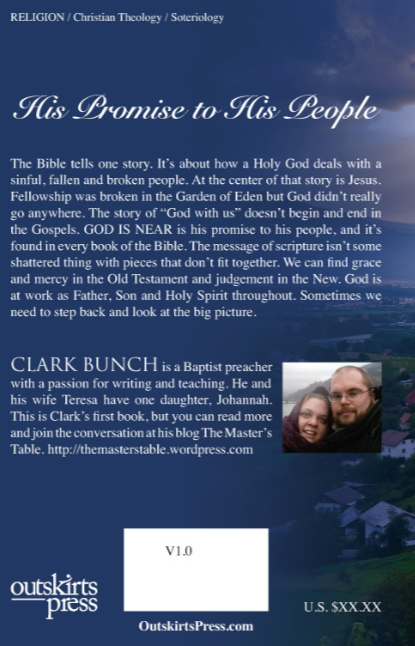 This entry was posted in God is Near and tagged Amazon, Barnes and Noble, book, Clark Bunch, e-book, God is Near, His Promise to His People, Kindle, Nook, Outskirts Press. Bookmark the permalink.